New Year Resolutions are new commitments for the upcoming year. New Year 2016 is about to begin. All of you must have made plan to welcome the New Year 2016, however very few of you might have made a plan for better financial life in 2016. 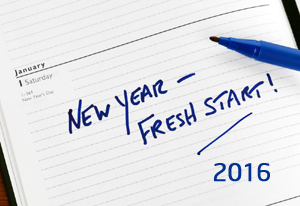 In order to help you, I am here with New Year resolutions for better financial life in 2016. Following this resolution will surely make your financial life healthy. Resolution 1 – I will buy an asset which appreciate its value with time. This year you should make a commitment to yourself that you will buy only appreciating assets in 2016. Buying a new car or expensive smartphone or any other depreciating assets does not make any sense. It will lose it value after few days or month. Resolution 2 – I will save at least 100 Rs every day invest it at the end of the month. You should make a discipline of paying yourself first. Make a pledge that you will save at least 100 Rs every day and invest this money at the end of the month in a good saving scheme or Mutual funds via SIP. Investing small chunk of money in discipline manner will surely help you to build bigger wealth at the end of a year. In short automate your finance. Buying unnecessary products in sale in not considered as a saving. This year pledge to take an informed decision while making any product purchase. We should make ourself ready for the future by making an emergency fund. If emergency fund is ready. Do not touch it unless it is an urgent requirement. If the fund is used, make sure to arrange similar amount as early as possible. Now onwards I will not believe in any get rich quick scheme easily. I will thoroughly investigate and invest my money if it is absolutely safe. Health is wealth. So in order to save wealth, I will take good care of my health. Remember “A healthy person can work with efficiency to earn wealth”. Knowledge is power. Take a pledge to make a conscious effort to learn and grow by gaining financial knowledge. What you don’t know about money will make you broke and keep you there. I am sure that these New Year Resolutions will defiantly make your financial life better. Prepare and write down your financial resolutions for the year 2016 in the piece of paper and paste it at your desk. To live wealthy life stick to your financial resolutions. Discuss with your family member so that they will also support you to keep these resolutions. Wishing all readers healthy and a wealthy year ahead. « How investor can file consumer complaints? This year, I am looking forward to getting out of debt. My financial goal for the year is to finish paying off my debts and to improve my credit score. Thanks for information that you have been putting up on your blog. Really pleased as it is a selfless a noble work.